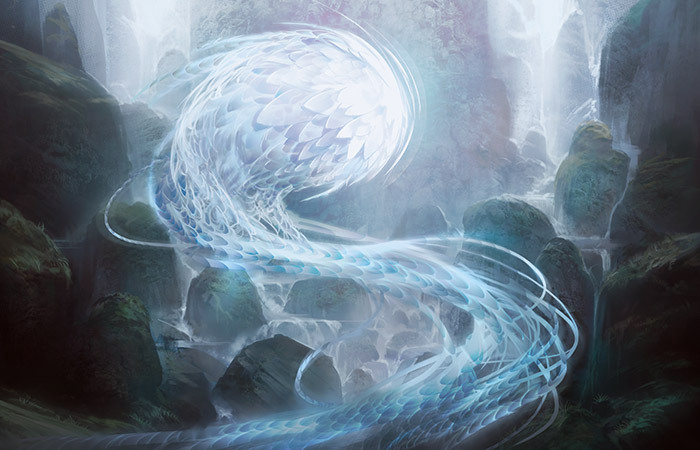 Welcome to the second Dragons of Tarkir Preview Week. This week, I'm going to continue the story of the set's design and also show off a cool new preview card. One you've seen before—well, kind of. As you'll see, Sarkhan really made quite a mess of Tarkir. If you haven't read my article from last week, I'd check it out, because today's article assumes you've read it. Last week, I explained how we started setting up the structure for the block. We began with a Large/Small/Large block where the middle set drafted with both large sets but the two large sets would never be drafted together. That led the exploratory design team to come up with the idea of telling a time-travel story. It would explain the structure by creating two timelines, one that led to the world of Khans of Tarkir and one that led to the world of Dragons of Tarkir. The big question was how exactly were we going to set everything up? We started by figuring out what the time-travel story needed. We wanted two distinctively different worlds that came from the same focal point in history. The creative team kindly gave us Sarkhan's home world, where we would shift from a warlord world to a dragon world. Part of making this work, though, was that we had to create a parallel structure. The two large sets had to be similar yet distinctive. The solution to this problem lay in the factions. We would start the block by introducing the audience to five warlord-led factions. While the dragons were extinct, we set it up so the feel of the dragons was present even though the dragons themselves had been killed off. This was done with the dragon attributes. Each clan would admire a different aspect of the dragons and mold its clan philosophy around it. This dragon attribute was important because it set up our parallel structure. You see, come Fate Reforged, we were going to get a chance to meet the five dragons that most embodied these five attributes. We would then follow those same five dragons through a new timeline where they are the warlords. This meant that we had five factions, each with two different incarnations. The through line would be the dragon attributes and two of the colors, one of which would be the dominant color. The third color would have to drop off to help differentiate the two timelines. Originally, by the way, we were planning to keep the five clan names throughout the block. Mardu, for instance, would start as a red-white-black clan in the first timeline but turn into a two-color clan in the second (red-black as white, the shared enemy, would be the one to drop out). The problem, though, was that the audience desperately wanted names for the wedges. We were concerned if we introduced wedge names and then changed what they meant, colorwise, we would create a lot of confusion. The decision was then made that the clan names only applied to the wedges and that when the dragons took over, their clans would simply be named after them. I explained last week how we set up the face-down mechanical through line in the block (morph then manifest then megamorph). The next step was to figure out how to represent each of the factions. We knew the following: To help define the factions, we wanted each one to have its own mechanic in each large set. That meant that in Khans of Tarkir, each faction would have its own mechanic and then, in Dragons of Tarkir, each faction would have its own mechanic, but a different one from Khans. This parallel structure would play up the differences while also highlighting the similarities. As I explained in this Fate Reforged preview article, if the first set has five faction mechanics and the last set has five faction mechanics and we have various face-down mechanics, we would run out of available keywords (we try to make sure blocks have between six and twelve keyword/ability words). That meant that Fate Reforged would have to borrow its faction mechanics from the large sets. To allow Fate Reforged to have three new keywords and Dragons of Tarkir to have four new keywords (well, one of them is a returning mechanic and one is a tweak of an existing one), that meant that Fate Reforged would have three Khans of Tarkir faction mechanics and two Dragons of Tarkir faction mechanics. 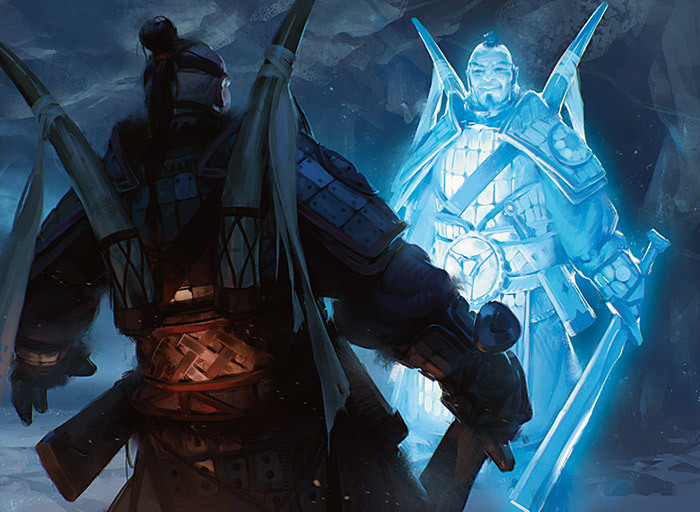 By choosing to use existing mechanics in Fate Reforged, it made it such that each faction (counting a faction by the color that's central to it) would have an overlap of its two mechanics. 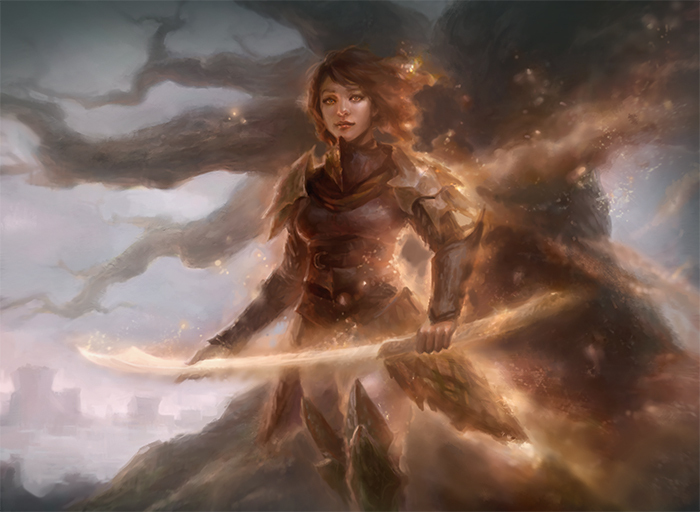 Two would overlap when Fate Reforged was played with Khans of Tarkir and three would overlap when Fate Reforged was played with Dragons of Tarkir. A good block design would mean that we had to create five pairs of synergistic mechanics. Remember that Dragons of Tarkir design, being a large set, started much earlier than Fate Reforged's design, meaning that finding the synergies between the mechanical pairs fell to the Dragons of Tarkir design team. I'm going to walk through the designs in the order we came up with them. As a quick aside, for all the mechanics below, we had one other important factor to remember. Dragons of Tarkir was going to be a "dragon set." The mechanics had to have somewhat of a draconic feel to them. We had some wiggle room, but we wanted to make sure these were mechanics that would feel correct if stuck onto a dragon. This transition was red-white-black to red-black. The Mardu mechanic was raid, so we needed to come up with a new mechanic that played well with raid. As I explained in my Fate Reforged preview article, that mechanic, dash, was created by both Sam Stoddard and me, independently, on our first homework assignment. I'm not sure how Sam came to the mechanic but I assume it was probably similar to the way I got there. Raid is all about attacking, so I started with a simple premise for the new mechanic—it had to have something to do with attacking. 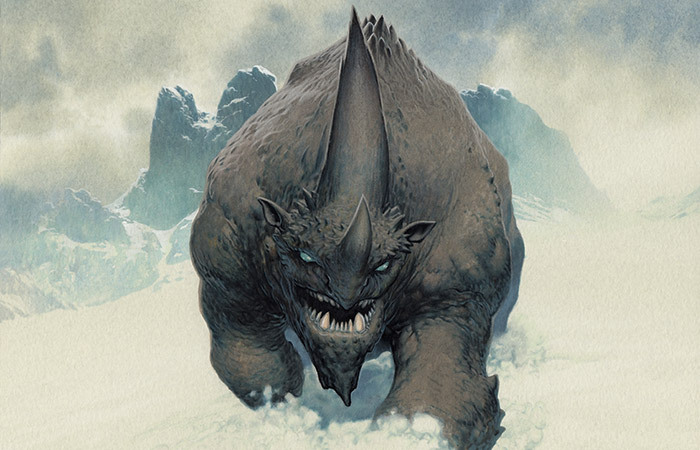 I thought about some form of attack trigger or a saboteur ability that worked when your creature dealt combat damage to an opponent. Eventually, I came across the idea of a creature that encouraged you to attack in a different way than raid. This thought got me to the card Viashino Sandstalker from Visions. It encouraged you to attack because it was going to bounce back to your hand at the end of the turn. That got me thinking. What if there was a mechanic that made use of this "downside"? What if you could pay an alternative cost to grant the creature haste but, if you did, it returned to your hand at the end of the turn? At first, I made vanilla creatures with this ability where the reason to use dash was the dash cost was cheaper than the mana cost. As I played around with it a little more, I realized there were a number of ways to make the bouncing back a positive thing rather than a drawback. As I continued designing cards with the mechanic, it was clear that there was something very interesting and that the mechanic had some cool design space. I was surprised when we sat down at our next design meeting and Sam had come up with basically the same mechanic. The team liked it and dash was the first mechanic put into Dragons of Tarkir. 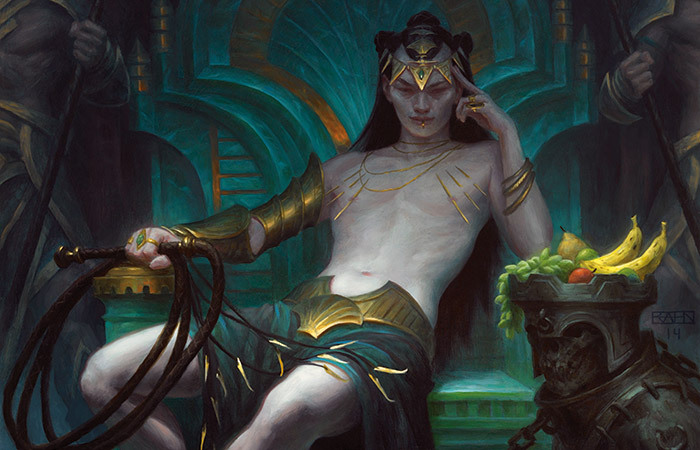 I should note, by the way, that we didn't yet know which mechanics were going to go into Fate Reforged. We were just choosing the five synergistic mechanics Dragons of Tarkir needed and we would let Fate Reforged's design team figure out which ones it wanted to use. The next transition we solved was blue-red-white into blue-white. 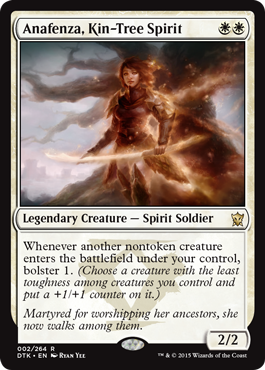 In Khans of Tarkir, this was the Jeskai clan and its mechanic was prowess. Prowess cared about noncreature spells getting cast, so the obvious first place to go was a mechanic that went on noncreature spells. Well, it turned out any noncreature spell worked with prowess, but we wanted something even more synergistic. What if we had a mechanic that allowed you to cast the same spell twice? As we messed around in this space, we kept coming close to a previous mechanics we've made. Spells you can cast multiple times from your hand? That's buyback. Spells you can cast out of the graveyard after you've cast them from your hand? That's flashback. Spells that you can fork? That's replicate or conspire. Spells that go off once and then go off again next turn? That's rebound. It quickly became apparent that instead of reinventing the wheel, why not just reprint one of the above mechanics? Buyback was tried during Journey into Nyx and failed, so that seemed out. Flashback had been done in Innistrad. Conspire had a "color matters" aspect that we weren't doing in this block. That left replicate and rebound. Replicate led to a large number of boosts on one turn while rebound spread out the bonus over multiple turns. After a little playtesting, it was clear that rebound was the mechanic we wanted. This transition was black-green-blue to black-blue. The Sultai mechanic was delve, so we were looking for a mechanic that interacted with something that encouraged getting a lot of cards in your graveyard. The most obvious choice was to find a mechanic that got cards into your graveyard. We toyed around with self-milling, but while it proved to be synergistic, it didn't create fun gameplay by itself. While we did want the two mechanics to work together, it was important that each mechanic was fun played independently. The next place we went was mechanics that got cards from your hand to the graveyard. Was there a mechanic that made use of discard? Again, we tried some things and nothing quite worked out. Next, we tried mechanics where you got things from the battlefield into your graveyard. This got us to playing around with sacrifice, which seemed thematically a good fit with black-blue. This got us to mess around with a mechanic we had first tried during Onslaught. The idea was a creature with an "enter the battlefield" effect that requires the sacrifice of a creature (in Onslaught the mechanic was tied to a specific race, as it was a tribal set). You could always choose the creature with the effect, effectively turning the spell into a sorcery (or an instant if it has flash), but if you had another creature that you cared for less, you could sacrifice that and keep both the creature and the "spell." This mechanic, with some fine-tuning, turned into the exploit mechanic. This transition started with green-blue-red and changed into green-red. The Temur mechanic was ferocious, which meant we wanted a mechanic that interacted with having bigger creatures on the battlefield. We first toyed around with a mechanic that made 4/4 creature tokens. That ended up proving a little too unwieldy so we looked for mechanics that also liked having big creatures. In the end, the solution proved to be to take the ferocious mechanic and turn up the dial. Ferocious wanted a single creature with power 4 or more. Formidable also looked at your creatures, but instead of wanting size on one creature, it needed combined size on all your creatures. We messed around a bit with what the right formidable number was (and it was development that solidified it at 8) but we liked that the mechanic played in similar space without being identical. There were even strategies where you got out a lot of little creatures, which was something you would never do with ferocious. This transition started as white-black-green and transitioned to white-green. The Abzan mechanic was outlast, so we knew we needed a mechanic that cared about either +1/+1 counters or size. Formidable already cared about size, so caring about +1/+1 counters seemed to be the right call. In fact, all we really needed was a mechanic that produced +1/+1 counters, as outlast already had cards that cared about creatures with them. We make mechanics that produce +1/+1 counters all the time, so going in, this seemed to be one of the easier tasks. It turned out to be the hardest. The reason we had so much trouble was that most +1/+1-counter abilities are about making your biggest creature bigger. That felt more green-based than white and we wanted our white-based clan to feel distinct. After trying numerous mechanics and failing, we decided to step back and ask ourselves what we were missing. The answer was that we wanted a mechanic that did the opposite of rewarding the biggest creature. Okay then, we asked, what if it did the opposite? What if the mechanic specifically made the smallest creature bigger? By asking this question, we solved our problem. Boosting the weakest creature had a very different feel. Also, because you had less control of what you could put the +1/+1 counters on, it played differently from our other +1/+1 counter mechanics. It only took one playtest for us to discover that we had the right mechanic in bolster. Once we had our mechanics, the next step was making sure they played nicely together (and by that I mean the five mechanics in Dragons of Tarkir). Ally-centered play meant that each mechanic would show up in three out of the five clans. For example, dash which was in black and red would show up in every clan but white-blue and green-white. Certain clan mechanics had a natural overlap. You could choose to sacrifice a creature for exploit that you dashed into play. Bolster helped you reach the 8 power needed for formidable. You could also dash a creature into play to reach the 8 power of formidable. Some mechanical overlap, though, fell to individual card designs. For example, we made a rebound card to make tokens that you could sacrifice to exploit. In addition, we made cards that touched upon things previously seen in mechanics from Khans of Tarkir. For example, there are creatures in white and blue that gain a bonus (although not +1/+1) when you cast a noncreature spell. It was important to us that you got glimpses of the world that no longer existed. In the previous timeline certain things had thrived, while here they showed up in just dribs and drabs. This, of course, leads us to another potent element of the set's design. We weren't just designing a set. We were designing an alternative timeline. That meant we got to play around with a world the players were familiar with and change it up. A lot of this work was done by the creative team, but design also wanted in on the fun. We made cards that showed you things you had seen before but now not quite the same. For example, we worked with the creative team to bring you back the five khans from Khans of Tarkir, but now living very different lives. Yes, in this timeline, Anafenza is a ghost. I'll let a future Uncharted Realms explain how she died. But death is not always the end in Magic and her spirit, quite literally, lives on. The design team had all sorts of fun figuring out different ways to hint mechanically at how the new timeline differs (or in a few cases doesn't differ) from the old. As you explore the set you will find all sorts of fun Easter Eggs. The final piece to the puzzle was making sure we were delivering on the set's ultimate promise of being "the dragon set." Scourge was sold as a "dragon set" and it didn't really deliver. Dragon's Maze wasn't promised to be a "dragon set" but having "Dragon" in the name led many players to hope, only to be disappointed. We knew Dragons of Tarkir had to deliver. Part of the problem was Fate Reforged had Dragons in it (quite a few, actually) and we wanted to be more dragon-y. Second, the cosmology of Tarkir had dragons born out of dragon tempests, meaning there weren't tiny baby dragons for us to make. All the dragons had to be of a sufficient size. The first restraint meant that we had to have a higher as-fan of Dragons than Fate Reforged while the second restraint meant we had to find a way to do so with lots and lots of big flying creatures. This task proved to be a monumental one, and it took all of design and then all of development to finally get the right mix. Next week, during my card-by-card stories, I'll walk you through a few of the Dragon choices we made. That's all the time we have for today. We had a lot of fun making a "dragon set" so we hope you all have as much fun playing it. As always I'm eager for any feedback on today's column or the new set. You can write to me through my email or any of my social media (Twitter, Tumblr, Google+, and Instagram). Join me next time as I start telling some card-by-card design stories. Until then, may there be many Dragons on the battlefield under your control. "Drive to Work #206—Arabian Nights, Part 3"
This podcast is the third part in my three-part series on the design of Arabian Nights. "Drive to Work #207—Design 102"
This podcast, based off of a Making Magic article, helps explain some of the basics of Magic design. This is a follow-up to podcast #154—Design 101.